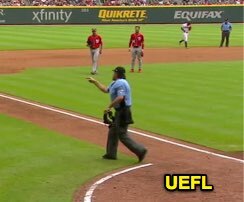 HP Umpire Phil Cuzzi ejected Nationals Bench Coach Chip Hale (balls/strikes; QOCY) in the top of the 4th inning of the Nationals-Braves game. With none out and none on, Nationals batter Tanner Roark walked, Victor Robles singled, Trea Turner grounded out, Bryce Harper walked, Anthony Rendon popped out, and Juan Soto flied out. Replays indicate that of the 21 callable pitches in the top of the 4th inning, Cuzzi properly officiated 21 of them (21/21, 100% accuracy), and the cited 3-0 pitch to Rendon was located over the inner edge of home plate and above the knees (px -.887, pz 1.751 [sz_bot 1.565]), the call was correct. At the time of the ejection, the Nationals were leading, 5-0. The Nationals ultimately won the contest, 6-4. This is Phil Cuzzi (10)'s third ejection of 2018. Phil Cuzzi now has -8 points in the UEFL Standings (-12 Prev + 2 MLB + 2 Correct Call = -8). Crew Chief Jeff Nelson now has -1 points in Crew Division (-2 Previous + 1 Correct Call = -1). This is the 167th ejection report of the 2018 MLB regular season. This is Washington's 9th ejection of 2018, 1st in the NL East (WAS 9; ATL, NYM 6; MIA 5; PHI 0). This is Chip Hale's first ejection since July 8, 2016 (Quinn Wolcott; QOC = Y [Balls/Strikes]). This is Phil Cuzzi's 3rd ejection of 2018, 1st since August 14 (Ben Zobrist; QOC = N [Balls/Strikes]).